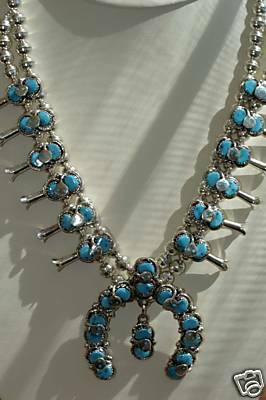 A very nice, brand new, Zuni Native American Indian crafted Squash Blossom Necklace and Earring Set. It is made from sterling silver and turquoise. The total length of the necklace is 23". It has 12 beautiful squashes on it. It is stamped Zuni and Effie C. The large center naja is 2 1/2" by 2 1/8". The earrings are 3/4" in length. This item comes with a certificate of authenticity. Turquoise is the birthstone of December and it is believed that it brings good fortune and strength.